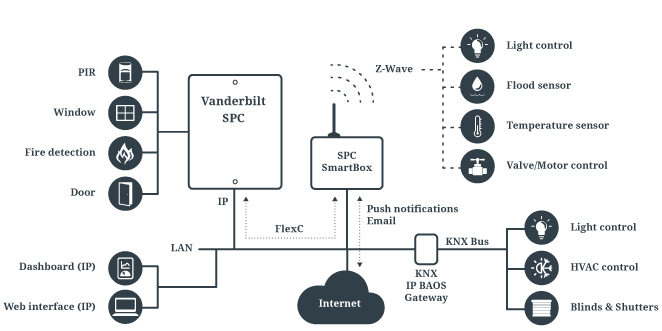 SPC SmartBox adds Smart Home and Building Automation features to Vanderbilt SPC Intrusion Detection System. The product is developed in close cooperation with Vanderbilt Industries and CTS Northern Europe. 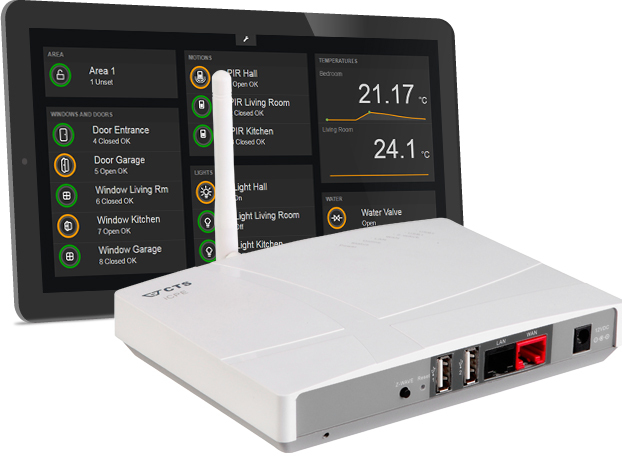 SPC SmartBox allows you to use all your SPC connected motion detectors, door/window contacts, fire detectors and alarm status for control of Z-Wave and/or KNX equipment. SPC SmartBox bridging feature, between KNX and Z-Wave, can be used to complement an existing KNX system with Z-Wave devices for e.g. uncritical lighting control. SPC SmartBox scene engine can also be used as a pure KNX logical module, with great flexibilities. An Away Scene could shut off all indoor lights, close the water valve, close blinds and shutters, when you arm the SPC system and leave the house. A Home Scene could turn lights on and open the water valve when you disarm the SPC system. A Night Light Scene could turn on the lights in the hallway and bathroom (for a couple of minutes) when the motion detector in the hallway (connected to SPC) detects a motion and it is night and dark in the room. A Flood Scene could close the water valve when the flood sensor detects a leak and send a push notification. A Burglary Scene could turn on all lights when the SPC system detects an intruder. For best reliability and responsiveness, all communications are bidirectional, handshaked and event driven. Vanderbilt reliable FlexC IP protocol is used for the SPC communication. This allows SPC SmartBox to listen on events, read status from the SPC system and send commands, e.g. Arm/Set, Disarm/Unset and Partset, to the SPC system (if it is allowed in the SPC). For the KNX communication, Weinzierl BAOS protocol is used. State changes on Z-Wave and KNX devices, even if the device is manually locally controlled, are automatically reported to the SPC SmartBox. SPC SmartBox scene engine has support for sending email and Pushover notifications. 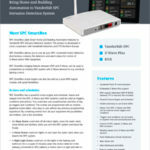 SPC SmartBox is based on the Z-Wave Plus certified iCPE Gateway from CTS. CTS is one of the leading Ethernet solution providers for global telecom companies, network operators and service providers. As option, the SPC SmartBox can be equipped with a battery backup module. SPC SmartBox will continuously be improved with new features and enhancements. The web based upgrade function allows you to easy update the device to the latest firmware. Lundix IT erbjuder all typ av systemutveckling på UNIX och Linux. Specialistområde är automation för hem, fastighet och industri. Uppdragen spänner från design och utveckling av webbsidor och appar till avancerade system för drift och övervakning av VA-verk, kärnkraftverk och tåg. Oavsett om du vill ha hjälp i ett litet eller stort utvecklingsprojekt i UNIX/Linuxmiljö är du välkommen att kontakta oss.